Custom motorcycle builder Cory Ness, with the help of his father the legendary Arlen Ness, has done it again in designing the breathtaking 2010 Cory Ness Signature Victory Jackpot® Motorcycle. This limited-edition masterpiece comes complete with Ness custom-designed paint, a powerful 106-cubic-inch Freedom® V-Twin Engine with diamond-cut heads, Ness Signature chrome, hand-stitched leather seats, and so much more. 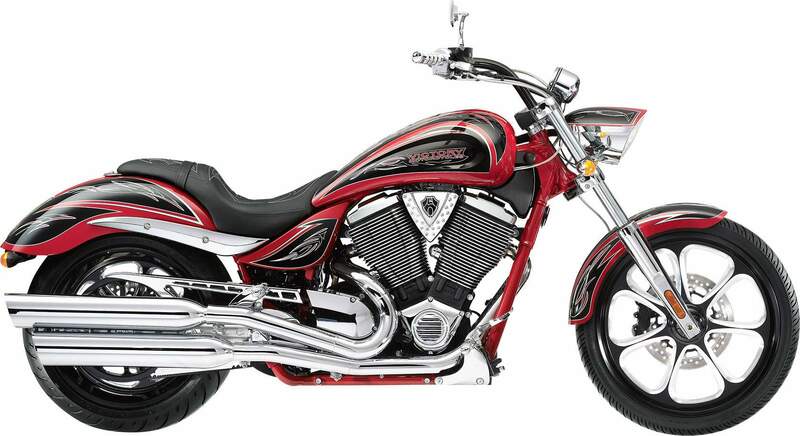 For smooth, powerful, eye-catching cruising on Main Street or cruising across state lines, the Cory Ness Signature Victory Jackpot® provides the ultimate experience. Find out more about its features, specifications, pricing, comparisons, reviews, videos, images, brochures, downloads, and locate your nearest dealer that has the Cory Ness Signature Victory Jackpot® Motorcycle. The premium-quality billet engine covers complement hte bike's overall custom treatment and feature distinctive Ness styling. The epitome of customizing, these precision dismond-cut cylinders help this Ness model stand out from the crowd. It's a premium styling touch from a custom master, Cory Ness. Each limited-edition bike has a metal plate with the bike's number, the Arlen Ness logo and a facsimile of Arlen Ness's autograph. Arlen likes his bikes long and low, so he has developed a seat that is lower than the stock Victory Vision seat. It's a custom, stitched seat that enhances the bike's flowing lines. The custom treatment extends to the tips of the handlebars with Ness custom grips. They complement the bike's overall custom treatment and feature Nexx styling. The bike rolls on contract-cut Ness "Evil 7" billet wheels with machined highlights. The rear pulley features the "Evil 7" design as well. Even the lower controls get the Ness custom treatment. The bright finish of these pegs complements the bike's rich chrome treatment.